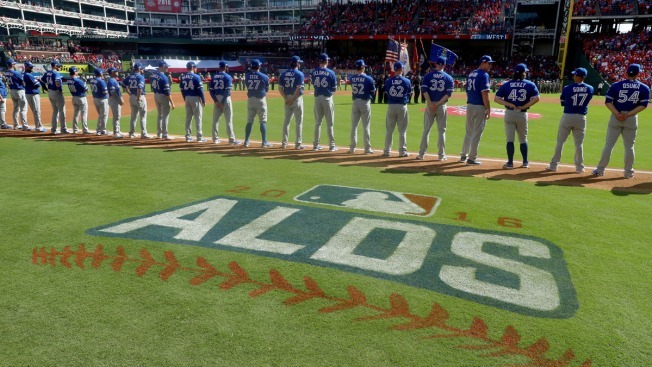 Marco Estrada took a shutout into the ninth inning, Jose Bautista hit a long, punctuating three-run homer and the Toronto Blue Jays opened their AL Division Series rematch with a 10-1 romp over the Texas Rangers on Thursday. Bautista, who had the emphatic bat flip after his tiebreaking homer in the ALDS clincher last October against the Rangers and got punched the last time the Blue Jays played in Texas in May, drove in four runs. He had an RBI single in Toronto's five-run third off All-Star left-hander Cole Hamels. Bautista added a 425-foot blast in the ninth inning, and the Blue Jays slugger seemed to deliberately drop the bat softly near home plate after his second homer of this postseason. Troy Tulowitzki hit a bases-loaded triple for the Blue Jays. Toronto has won four straight overall, including an 11-inning, 5-2 victory over Baltimore in the AL wild-card game Tuesday night. Estrada, an All-Star this season, limited Texas to four hits, the last Elvis Andrus' leadoff triple in the ninth. Manager John Gibbons removed the right-hander after Shin-Soo Choo's RBI grounder ended the shutout bid. Estrada has never pitched a complete game in the majors and the Blue Jays didn't throw one this season. No matter, Estrada gave them all they needed to start this best-of-five series. Last October, Estrada excelled to win Game 3 of the ALDS at Texas. Toronto had to win its last two regular-season games at AL East champion Boston just to make the playoffs. The Blue Jays then won at home this week when Edwin Encarnacion hit a game-ending, three-run homer to beat Baltimore. Bautista was booed heartily during pregame introductions and while he batted in the first inning. There also were chants of "Rougie! Rougie!" -- those were for Rougned Odor, the second baseman who punched Bautista and ignited a bench-clearing brawl in their last meeting May 15. Odor was suspended seven games. By time Bautista led off the seventh with a walk, the ballpark was quiet with the Rangers down 7-0. After he homered, a fan threw the ball almost back to the infield. The only hit Estrada allowed in the first six innings came when Adrian Beltre led off the second with a soft grounder to the right side of the infield, when the pitcher didn't get over to cover the base. Texas didn't have another hit until Carlos Beltran singled in the seventh, but was promptly erased by a double play. Hamels, the MVP of the 2008 World Series and NLCS for Philadelphia, threw 42 of his 82 pitches in the third. He allowed seven runs (six earned) with three walks in 3 1/3 innings. Ezequiel Carrera was on second base with two outs in the third when Josh Donaldson hit a liner toward third base. Donaldson had even stopped running, assuming that Beltre would catch the ball -- instead, the rising liner ricocheted off the mitt of the four-time Gold Glover and into left field for an RBI double that made it 1-0. Encarnacion then had a single on a liner off Hamels' outstretched glove, before Bautista's run-scoring single and Russell Martin's walk to load the bases. Tulowitzki followed with a triple deep into the right-center gap on a ball that All-Star center fielder Ian Desmond might have lost when running out of the sun and into the shadows while getting close to the wall during the late afternoon. Melvin Upton Jr. homered starting the Toronto fourth before Andrus' one-out throwing error from shortstop allowed leadoff hitter Devon Travis to reach. Donaldson, who had four hits and walked, then had an RBI double to chase Hamels. Alex Claudio then pitched 3 2-3 scoreless innings. When Texas had errors on three consecutive plays in that shaky seventh inning of Game 5 last October, leading up to Bautista's homer, Andrus had two of them. Andrus had misplayed a grounder to start that frame, and dropped an easy toss on what would have been a sure force out. Blue Jays: Closer Roberto Osuna came out of the AL wild-card with shoulder soreness, and it was never clear beforehand if the right-hander was available for the ALDS opener. He was never needed. "If not today, there should be no limitations (Friday)," manager John Gibbons said before the game. Rangers: Choo was on the postseason roster, batting ninth in the opener and went 0 for 3. He had four stints on the disabled list this season, and had missed 39 games with a fractured left forearm before returning for the last three games of the regular season. Blue Jays: LHP J.A. Happ, a 20-game winner, allowed one run in seven innings in a win against the Rangers on May 5. He stars Friday afternoon at Texas. Rangers: Yu Darvish starts only his second postseason game in his five seasons with Texas. The right-hander from Japan lost the 2012 AL wild-card game against Baltimore, and missed last season after Tommy John surgery.